Beets contain unique phytonutrients called betalains, which are responsible for their deep purple or golden color. If you can buy your beets with their green leaves still attached, go for it! Our ancestors actually ate only beet greens, before discovering and utilizing the root that is common today. Beet greens can be prepared like spinach. I love to lightly steam or sauté them with garlic and ghee. 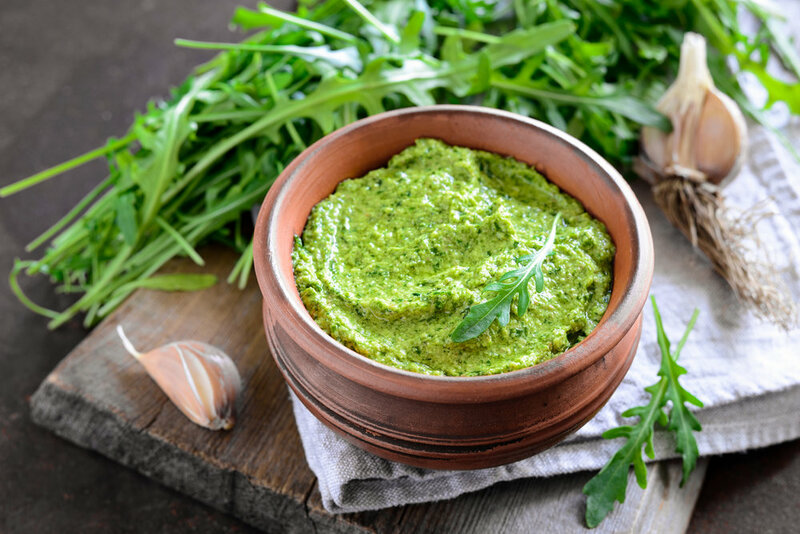 To make the pesto, add all of the ingredients except the olive oil to a food processor. Begin to process and add oil slowly until smooth. You may need to scrape the sides of your food processor. Heat 1/2 tablespoon ghee or coconut oil in a medium skillet over medium heat until bubbling. Add onions and sauté until translucent, about 3 minutes. Reduce heat to the lowest setting, cover, and let onions cook for 30-45 minutes, stirring occasionally. I usually check on the onions every 15 minutes or so, and quickly mix them each time. The onions are caramelized when they are sweet and browned, but not burnt. Preheat oven to 400 F. While the onions are caramelizing, cut each beet in half and slice into half-moons. Toss with 1 tablespoon melted ghee or coconut oil and arrange on a single layer on a baking tray. Roast until fork tender, about 30 minutes. While beets are roasting, heat a nonstick skillet over medium heat. Add sausage crumbles and sauté until no pink remains, 5-8 minutes. Pre-heat the broiler and place a rack as close to the flame as possible. Whisk together all crust ingredients and let sit for 5 minutes. Don't worry that this mixture does not look like dough! It will be more liquid than dough. Pour liquid into your prepared baking tray. Using an oven mitt, place the top rack down one position. Return the crust to the oven to crisp, about 5 minutes. Again, watch closely so it does not burn. Spoon on enough pesto to lightly cover the crust. Top with onions, beets, sausage and crumbled goat cheese. Bake until cheese is melted, about 8 minutes. While the pizza is baking, prepare a steamer by bringing 2 inches of water to a boil. Add spinach to a steaming compartment or basket and cover. Steam for about 30 seconds, or until just wilted. Top with a dash of sea salt and fresh black pepper. Remove pizza from oven and let cool just slightly. Cut into 9 large pieces. Enjoy pizza with steamed spinach. Store 2 servings of pizza in an airtight container in the fridge, for lunch tomorrow.